Background: NF-κB is a ubiquitous transcription factor that was discovered three decades ago. Since its discovery, this protein complex has been implicated in numerous physiological and pathophysiological processes such as synaptic plasticity, learning and memory, inflammation, insulin resistance, and oxidative stress among other factors that are intricately involved and dysregulated in Alzheimer's disease (AD). Methods: We embarked on a methodical and an objective review of contemporary literature to integrate the indispensable physiological functions of NF-κB in neuronal phsyiology with the undesirable pathophysiological attributes of NF-κB in the etiopathogenesis of Alzheimer's disease. 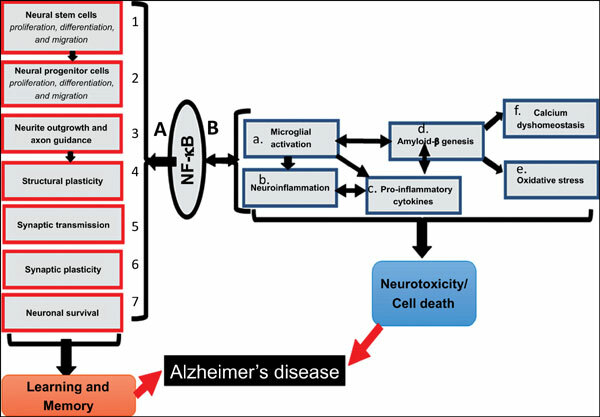 In our approach, we first introduced Alzheimer's disease and subsequently highlighted the multifaceted roles of NF-κB in the biological processes altered in the progression of Alzheimer's disease including synaptic transmission, synaptic plasticity, learning, and memory, neuronal survival and apoptosis, adult neurogenesis, regulation of neural processes and structural plasticity, inflammation, and Amyloid-β production and toxicity. Results: Our comprehensive review highlights and dissects the physiological role of NF-κB from its pathological role in the brain and delineates both, its beneficial as well as deleterious, role in the etiopathogenesis of Alzheimer's disease. Conclusion: In light of our understanding of the duality of the role of NF-κB in the pathogenesis of Alzheimer's disease, further studies are warranted to dissect and understand the basis of the dichotomous effects of NF-κB, so that certain selective benevolent and benign attributes of NF-κB can be spared while targeting its deleterious attributes and facets that are integral in the pathogenesis of Alzheimer's disease. Keywords: Alzheimer's disease, Amyloid-β, synaptic plasticity, learning, memory, neuroinflammation, neuronal death. Keywords:Alzheimer's disease, Amyloid-β, synaptic plasticity, learning, memory, neuroinflammation, neuronal death. Abstract:Background: NF-κB is a ubiquitous transcription factor that was discovered three decades ago. Since its discovery, this protein complex has been implicated in numerous physiological and pathophysiological processes such as synaptic plasticity, learning and memory, inflammation, insulin resistance, and oxidative stress among other factors that are intricately involved and dysregulated in Alzheimer's disease (AD). Evolutionary Considerations on the Emerging Subculture of the E-psychonauts and the Novel Psychoactive Substances: A Comeback to the Shamanism?